What do I have to do to get a my art piece restored? Before we treat an art piece at the ACLM, our conservator must perform a meticulous examination of the physical condition of your object and a condition report.﻿Before clients commit to a full examination we offer a free 30 minute complimentary consultation for new piece brought to our lab. ** * Free complimentary consultations, examinations and condition reports are appointment based only. ﻿During a complimentary consultation the conservator will provide you a general idea of the conservation needs of your artwork a general idea of the costs involved. It is not frequent but the general idea of the costs provided during the consultation with the conservator once the examination and a condition report are completed. During the examination the art object will be analysed under regular, ultra violet and sometimes under infrared illumination. A condition diagram and photographic documentation are included in the condition report. Cleaning and solubility tests need to performed at this time in an unconspicuous area unless client requests something different. Based on the information collected in the condition report, the conservator will formulate a treatment proposal designed to address the particular conservation needs of your art object. Only then, a detailed treament proposal and treatment quote can be provided. Examination reports are essential for any art collector and art institutions as these are key documents for insurance purposes, appraisala and authetification. Examinations and condition reports incur in a $150.00 fee per object. *** Treatments are independent from consultation fees and examination/condition reports. Can ACLM staff value or authenticate my work? The Art Conservation Laboratory of Michigan focuses on the preservation, conservation and restoration of artistic works. We do not do appraisals or authetification. If you are looking for an appraiser we suggest you to contact the International Society of Appraisers or the Appraisal Foundation. If I send a picture by email or if I describe over the phone the condition of my piece can the ACLM tell me what treatment does my art piece needs and what would the cost be? As professional conservators we understand that the physical condition of an art is complex. Think of it as a patient who is sick. Although a description over the phone or a digital photography could provide a general idea of the condition, this information would not be enough for a physician to give a diagnosis or prescribe medication. In a similar way, we believe it would be negligent of us to offer a treatment proposal or an estimate without having examined the piece first. The fact is that there are so many details that could be missed and we take the condition of your piece seriously. Hence, it is crucial for us to inspect your piece to be able to provide you with an accurate treatment proposal or a treatment quote. The image below depicts a cleaning test made to assess the chemical sensitivity of paint and the vanish films. This test was also useful for our client to see the results that could be expected after the treatment. 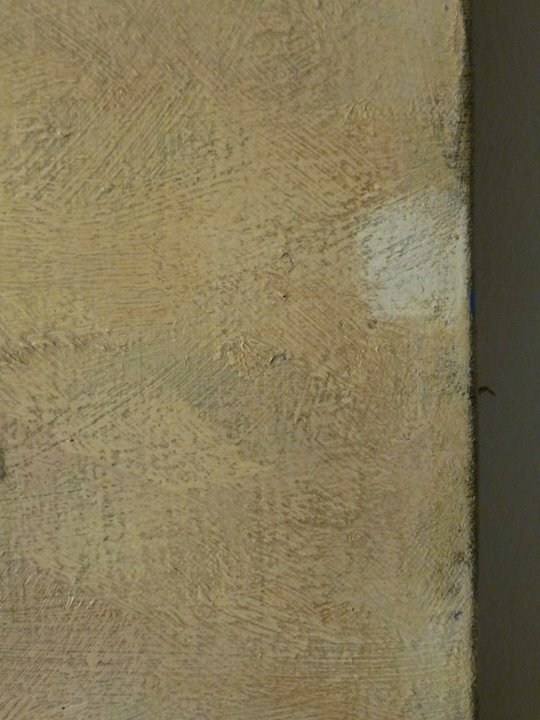 Painting with aged and discolored varnish. c.1930 (cleaning test). *Full examination and condition reports incur in an examination fee. **After 30 minutes consultations will incur in our consulation fees. ***Examination and consultation feed are sepate from the treatment quote. Chinese porcelain. Detail. Before treatment. Chinese porcelain. Detail. After treatment.